This was the first time we visited the Hielander Festival in Alkmaar. Shame on us, because this was already the forth edition of the festival. Check out the video-report we made. Only a month before we met Wullie MacMorland, owner of the Hielander Restaurant . Even though his restaurant was closed at the time we visited, he very kindly showed us around. We thought it would only be polite to visit the festival that was initiated by Wullie together with Ebbo Voorhout of the Grand Church in Alkmaar. Alkmaar is really a lovely place to visit. It has a lot of well reserved typical Dutch houses and of course a few canals. Alkmaar, a mere 40 km north of Amsterdam, is most famous for it's traditional cheesemarket. Like many other whisky festivals in the Netherlands, the venue is located in a church. We're not sure if this says more about religion in the Netherlands or devotion to whisky. Anyway, the place is well located and the church, with it's 500+ age, is really grand. And luckily warm enough too. A nice mix of market house and independent bottlings, old and new expressions, there's something for the starting whiskydrinker as well as for the more experienced connoisseur. Especially nice about this festival is that the organisation has made a level playing field in terms of space and promotion. Every participant gets a plain table, same size for everyone, be it Diageo or Kintra. Most entry levels drams are free to try, using your complimentary Hieland 2014 Glencairn nosing glass, for others there's an extra fee. Having visited several (...) festivals before, we are always looking for those hiddens gems at a festival. First one was a Mosstowie 1979, bottled by Dutch firm Van Wees, in their Ultimate Selection (already over 500 different bottlings!). A subtle Speyside whisky, produced with Lomond stills. Mosstowie was never a distillery of itself, it was produced within the Miltonduff distillery. This is typically a whisky that developes in the glass. It started floral, a bit of straw and after 10 minutes or so the mint appeares. Amazing indeed. 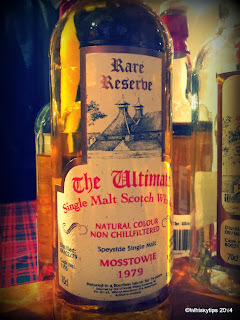 Another great dram was the Mannochmore 1984, bottled in 1997 by Gordon and MacPhails, you know that family owned business that has the most beautiful casks filled with great malt. Mannochmore is often overlooked, as it is a workhorse for many Diageo blends and a relatively young distillery. Well can we bring forward that the age of a distillery is no guarantee for a good malt? Mannochmore proves the opposite. Maybe we shouldn't promote Mannochmore that much, but hey,they might be looking for a brand ambassador in the future..
Another very nice dram we enjoyed is the Benromach Origins Batch no. 4, matured in Port pipes. Benromach seems to have found a nice balance between the wine and the whisky. If you don't believe us, try the latest Benromach Sassicaia finish.